"In Scotland, panic buying of petrol is rampant, with Scots putting in as much as five pounds at the pump." — BRIAN BLESSED, Have I Got News for You note For transatlantic reference, £5 is around $8, next to nothing in terms of US petrol buying and next to the square root of bugger all in more expensive Britain. Along with being brave and violent, Scottish people are also often stereotyped as being thrifty, if not outright stingy, with their money and belongings. Within Scotland itself, people from Aberdeen may be stereotyped as being especially thrifty. Probably Truth in Television, since Scotland has always been a poor area compared to England, not to mention being considerably less fertile than the south. Thrift is a necessity under such circumstances. This would be perhaps supported by the fact that among Englishmen people from Yorkshire have a stereotypical reputation for thrift. On the other hand, Ireland has in large periods of its history been considered even poorer but the Irish are stereotyped as impulsively generous. Part of the reason for the Scottish reputation for thriftiness is the dominance of the (Calvinist) Presbyterian church and the importance of the Scottish school of economics in the tradition of Adam Smith. Indeed, the Scottish reputation for thrift probably comes from the early 18th century, shortly after the union with England, when a lot of business-savvy Scottish Covenanters (i.e. Serious Scottish Presbyterian Calvinists) started to come to England to start commercial ventures; the role of these Scottish businessmen in the Industrial Revolution—also pairing up with very thrifty English Nonconformist Protestants—cemented the association of the Scottish people with fiscal caution. All this has tended to make large parts of the world look on the Scots as embodiments of the Protestant work ethic who are "all work and no play", combining the stereotype of the Thrifty Scot with that of the Dour Scot. See The Scrooge and All Jews Are Cheapskates for examples of non-Scottish people who don't like to spend money. Disney Ducks Comic Universe: Scrooge McDuck hails from Scotland, probably because of his love of money. Despite being the richest duck on Earth, Scrooge resents spending even the smallest amount of money. In The Micro-Ducks From Outer Space, when the micro-ducks (who are all no more than three inches tall) offer Scrooge a bag of gold coins in trade, Scrooge has to examine them under a microscope to see them properly and comments "How about that? Gold coins no bigger than a Scotsman's tip!" Scrooge's whole family is noted to be thriftier than most Scots, and when Scrooge is revealed to be the thriftiest of the family in history, the ghosts of his ancestors carry him in triumph. Middenface in Strontium Dog is one of these, and usually asks Johnny for a loan whenever he appears. Asterix and the Britons has a gag where our heroes need to track down a barrel of magic potion that's been hidden among identical wine barrels. A smiling barkeep turns dour on seeing they're ordering one cup for three, asking if they're Caledonian (the Roman name for Scotland). Jommeke has a character named Mic Mac Jampudding who is basically a walking Scottish caricature. He will always try to avoid spending money on anything. In the album "The Jubilee" he brings a bottle of mountain water to Jommeke's birthday, which he bottled himself in order not having to buy it in a store. Judge Dredd once exploited this trope during a Cal-Hab day parade where he was chasing a perp through a crowd of Cal-Habbers. When he announces that a half-cred note has been dropped, causing everyone but his perp to duck to look for it, allowing Dredd to nail the perp. I'll Be There, a 2002 movie starring Charlotte Church and Craig Ferguson, had Ferguson's drunken, profligate ex-rock star character crash through his mansion's window on a motorbike. While in the hospital the next day, the doctor asked him if he had suicidal feelings; he replied, "Why would I do that? I'm rich, and I'm Scottish." Flashman's father-in-law is a wealthy Scotsman who does no approve of Flashman's profligate ways and often threatens to stop supplying him with money. Laura Ingalls Wilder was of Scottish descent on her mother's side. A couple of times in the books, Pa makes an admiring comment about Ma's Scottish resourcefulness with food when they're living in the middle of nowhere. In the poem "The Lang Coortin' " by Lewis Carroll, the lady is thriftily Oblivious to Love. When her suitor sends her golden rings, she has them made into a chain for her dog; when he sends her locks of his hair, she uses them to stuff a cushion; when he sends her a letter declaring his love, she returns it unread, because the postage wasn't prepaid. In one of Mercedes Lackey's The Elemental Masters books, one wizard makes a throw-away line about having to take care of some magical issue in Loch Ness. He speculates that the Scots will somehow find a way to make money off it while the character he's talking to claims that the Scots will "use every part of a sheep but the 'baa'." The "Poet McTeagle" sketch from Monty Python's Flying Circus chronicles what are ostensibly the poems of Scotland's greatest poet, but are actually all requests for money. Classic Doctor Who serial "Terror of the Zygons" used this stereotype as a punchline for the last episode. The majority of the action took place in Scotland but for the finale the action moved to London. At the end the characters go back to Scotland so that the Doctor can retrieve the TARDIS, which he and Sarah leave in. The local duke whom they had rescued then berates the Brigadier (who had been earlier wearing a kilt) for calling himself a Scotsman, yet not getting the Doctor and Sarah to give him their unused return train tickets to London so he could get a refund. One of the first claims discussed on Would I Lie to You? was from Scottish multimillionaire Duncan Bannatyne of Dragon's Den fame, saying that he'd banned his employees from buying paper clips, forcing them instead to use only the ones that came in with the mail. Angus Deayton: Lee, what are you thinking about this? Lee Mack: Well, I have to say, the idea of saving money on paper clips is absolutely ridiculous, although the accent is swinging it a little bit... Okay, we think that's true. An episode of Dad's Army involves Frazier maniacally hanging onto his stash of gold coins despite all Captain Mainwaring's attempts to get him to put it into his bank. When David Tennant appeared on Qi, Lee Mack made a joke about Tennant being a Thrifty Scot. Tennant then started waving his pen around like it was a Sonic Screwdriver. He then made an observation that during World War II, the British army had a tank touring throughout the UK, and encouraged people to chuck their spare change into the tank for the war effort. Tennant: And where did they get the most money? Glasgow! Lee Mack: Yeah, 'cause they thought it was a big fruit machine. 'Look, I won a soldier, Mummy!'" Only An Excuse sometimes portrays the Celtic board like this, such as suggesting they invaded the pitch after a supporter threw a 50p piece at the ref. Peebles Body (to a Townsman who was supposed to be in London on a visit): E-eh, Mac, ye're sune home again! Mac: E-eh, it's just a ruinous place, that! Mun, A had na' been the-erre abune Twa Hours when - Bang - went saxpence! Possibly the least insulting stereotype thrown around in "A Song of Patriotic Prejudice" by Flanders and Swann. Eric Bogle often pushes this stereotype about himself, usually at the expense of of other band members; such as suggesting that he doesn't pay them. You know, Fala is Scotch, and being a Scottie, as soon as he learned that the Republican fiction writers in Congress and out had concocted a story that I'd left him behind on an Aleutian island and had sent a destroyer back to find him- at a cost to the taxpayers of two or three, or eight or twenty million dollars- his Scotch soul was furious. He has not been the same dog since. The characters Hamish and Dougal, created by Graeme Garden and Barry Cryer originally for the Sound Charades round in I'm Sorry I Haven't a Clue. The Catch-Phrase "You'll have had your tea?" is intended to be heard as "You're not expecting me to feed you, right?" This, combined with Violent Glaswegian, is a major part of Billy Connolly's act. "My uncle once dropped ten pence; he bent over to pick it up, and it hit him in the back of the head." One time, Connolly was on Conan O'Brien explaining that he once bungee jumped naked on his travel show because the bungee place had a policy that if you jumped completely naked, it was free. When Conan asked why he did this just to save a few tens of dollars, Connolly replied "You'd have to be a Scotsman to understand". In Of Thee I Sing, countries from around the world send baby carriages to the White House. The wee little one at the end is "Compliments of Scotland." Peachum, the miserly and hypocritical Beggar King of The Threepenny Opera is sometimes given a Scottish accent in English language productions. Including when no one else in his family has one. In Disney's The Adventures of Ichabod and Mr. Toad, in the The Wind in the Willows segment Angus McBadger is in charge of Toad's finances and thus is very concerned about money. However since Toad is an Upper-Class Twit whose various manias and hobbies have threatned to bankrupt him, and his tendencey to cause huge amounts of damage without a care, this is very justified. In the Disney cartoon Pigs Is Pigs, the conflict in the story is partially because the Scottish McMorehouse doesn't want to pay an extra 4 cents to have the guinea pigs shipped as "pigs" rather than as "pets". In the Looney Tunes cartoon "My Bunny Lies Over the Sea," the Scotsman whom Bugs Bunny messes with is shown as being thrifty. He has only one bullet that he has kept in the family for years, and he is tricked into lowering Bugs' golf score because Bugs makes it seem like an auction and his immediate reaction is to want a lower number. The Tex Avery cartoons The TV of Tomorrow and The Car of Tomorrow have a "thrifty Scotchman's model" joke; a flashlight on the former, a pedal-operated car on the latter. In the Animated Adaptation of Soul Music, Mr Clete, the Guild of Musicians president who is horrified by the idea of people playing or listening to music without the Guild getting a cut, has a Scottish accent. While he doesn't have a typical Scottish accent (he talks like a pirate), Eugene H. Krabs otherwise fits the bill here EXTREMELY well. Two Scots once took a bet for a penny. The gamble? Which one of them could stay under water the longest. The outcome? They both drowned. A Scotsman and an Englishman were leaning on a store counter, when a a robber walked in carrying a gun. The clever Scotsman took out his money and handed it to the Englishman, saying "Here's the ten pounds you lent me." A large proportion of the jokes about Gordon Brown while he was Chancellor of the Exchequer played on this trope (ha, ha, the frugal Scot is in charge of the country's finances! It's so funny!). Brown didn't help his case by playing into another stereotype about Scots: that of the "dour Scotsman" who shows no emotion and is consistently gloomy in his mien if not his outlook. The jokes persisted somewhat during his tenure as Prime Minister, given that he was overseeing the country during the financial crisis and money matters were front and center, but strangely, his Chancellor, the equally-Scottish (if born in London) Alistair Darling, did not receive the same treatment. The Scotch brand of tape gets its name from an incident where the first attempts didn't have enough adhesive on them, prompting buyers to call the makers "Scotch" (which used in this sense is a pejorative). The story goes that the tape was originally manufactured by 3Mnote Standing, at the time, for "the Minnesota Mining and Manufacturing Company," and as such involved in the Midwestern industrial network for Detroit engineers and auto stylists to separate different colors of paint, e.g. in two-tone paint jobs. The original tape only had adhesive on the two edges, leading to bleeding paint. The Detroit guys sent a message to 3M's chief engineer telling him some variation on "take this Scotch tape to your Scotch bosses and tell them to put adhesive down the middle." 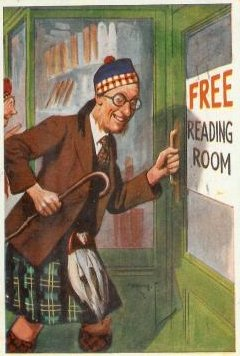 The image of Scottish thriftiness is also popular in Germany, where you sometimes see advertisements proclaiming goods at "Schottenpreise" (Scotsmen's prices). In Germany itself some Protestant regions also have a reputation for thriftiness or stinginess, e. g. Swabia (Württemberg), Westphalia and within Westphalia Lippe (a rural region with a strong Calvinist tradition). There is also the common expression preußische Sparsamkeit (Prussian thrift). As late as the 1980s the US supermarket chain Safeway had an in-house brand called "Scotch Buy", with a jingle to (very roughly) the tune of "Loch Lomond". Automaker Studebaker introduced a budget-conscious series of cars called the Scotsman in the 1950s, which eliminated many options such as a radio and cigarette lighter to cut costs. James McElvar, singer of Scottish boy band Rewind, wore all of his clothes on board a flight in an attempt to bypass a £45 luggage fee. Unfortunately for him, it caused him to suffer heat exhaustion and pass out. Luckily, he got better.